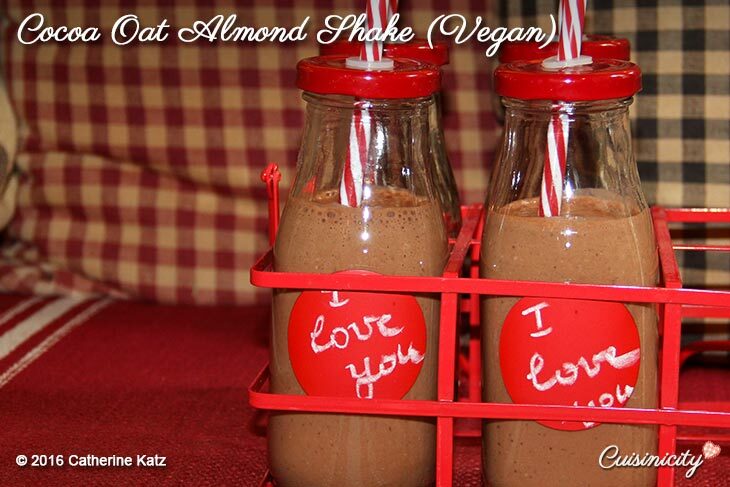 If you love deep dark chocolate, you will absolutely love this Cocoa Oat Almond Shake! It goes down so smooth and it’s so good for you!! There is no added sugar–the sweetness comes from the ripe frozen banana and the medjool date, but interestingly, you don’t really taste either. It just tastes decadently chocolaty rich and creamy! Of course, that richness has nothing to do with cream and has everything to do with the hidden black lentils (*canned is fine—click here for a brand I like) and old fashioned rolled oats. The result is just power nutrition–protein, fiber, minerals, vitamins and antioxidants that will fill your tummy (and your kids–YES!!) –what better way to say I love you! Little Tips: Make sure you peel banana BEFORE you put it in a tupperware in the freezer! I like to have a whole bunch ready to go for this shake, but no worries if you forget to have some ready to go, you can always use a fresh unfrozen ripe banana and just add ice (about 1 cup) to the shake and process until smooth. Also, I prefer to use black beluga lentils but any type of lentils will do, and again, I like to have some ready to go in a tupperware in the fridge! I have loved this recipe since Catherine first put it on her blog! Such a healthy “protein shake”. I make it for my boys, (grown) but I make it more for myself! Love it, and love the addition of lentils! Thank you, Catherine. My son loves this smoothie so much that I am afraid his is overdoing. He wants it in the morning and then again at night. I thought that after a couple of weeks he would have gotten tired of it, but no he is still going strong. Thank God for his workouts. Thanks again Catherine. Another great recipe. I just made this smoothie and I am feeling happy. I felt like I just had a chocolate bar. Can’t wait to try it on my husband and my nine year old for breakfast tomorrow morning. I am sure that they are going to love it. Thanks for sharing your recipes. Love raisins in cookies, and just finished eating a big, cool, crisp Honey Crisp apple from the Okanagan Valley in BC. So, the transition to making this recipe couldn’t be more natural. Haha! Spreading the cheer, Catherine. Will post a review too. Yum!!! I can’t wait to make this! les bananes attendent gentiment de se congéler mais ensuite …elles passent à la casserole! ah!ah! merci pour cette recette inattendue as usual! Another great recipe from Catherine. 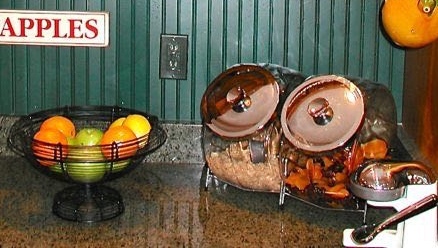 Like Barbara, I’m sure my daughter will be happy to have his idea for her son’s a.m. nutrition (he too is a B person). Thank you, Catherine. Hey Catherine! Thanks for the suggestion. I went to the store with a mission, starting with the end in mind, which for a parent with a young family and busy life is a real added benefit. (The habit of aimless wonderings in grocery stores when dinners need to be prepared and no ideas about what to cook isn’t optimal.) So from the start, receiving a suggestion like this one is really helpful. Thanks again. I cooked the lentils and blended the ingredients into a smoothee. In my eagerness and rush, I discovered how to improve my efforts for the next time. Using a frozen banana as recommended is important. Especially when first impressions count. Smoothees are great too when served chilled. So note to self for next time. My son liked it!! This equates to a big check because he hates lentils and will eat oats only if they come from a processed and packaged source. There are big smiles here and koodos to Cuisinicity for it’s innovations and depth of understanding nutrition and nutrition related challenges. Raising health conscious children is challenging. YES the frozen banana is crucial because it really imparts both its creaminess and the ice cold smoothie texture, but also because when frozen solid, it doesn’t really give out as much of a banana flavor and lets the dark chocolate predominate as it should! One of my daughters can’t stand the texture of a ripe fresh banana because it is too mushy but I have the feeling that she will LOVE this smoothie, it’s that subtle when the banana is frozen (I can’t wait for her to try it HAHA!!). Just make sure to peel the banana BEFORE you put it in the freezer in a tupperware, otherwise, you will find it impossible to peel once frozen!! The article is indeed disheartening but we cannot give up the fight as the prize of years to life and life to years for our children is so worth it, and again, one doesn’t have to “suffer” through it, as you know we can love the food that will love us back and that’s half the battle! Haha! My hand was halfway to the freezer when remembering to peel the bananas…. It gives me confidence to go to Cuisinicity’s cooking videos and start learning more. And thanks for the wonderful feedback! With a stash of cooked lentils in the fridge and frozen peeled bananas in the freezer, I was ready for this morning. My daughter hates my smoothies because they are often too thick – but liked this one and drank it all. bonjour ! Votre fils boit ça avec concentration, pas de place pour autre chose , tellement ça a l’air bon! eh bien , moi aussi je vais essayer bientôt…. the new way to learn how to concentrate itself ? 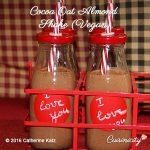 …drink cocoa oat almon shake, this it! yeeeh! martine de France improving her English! !